I recently had the opportunity to attend the Nygren Placemaking Conference in Serenbe, Georgia. Serenbe is a master-planned, self-proclaimed “wellness community” on the outskirts of Atlanta that has attracted international attention for its unorthodox development approach. In its layout and built form, Serenbe has more in common with a village in the English countryside than with most of the suburban subdivisions that pepper the forests around Atlanta. Serenbe founder Steve Nygren, a veteran of the Atlanta hospitality industry, tells his practiced origin story as follows. Alarmed by the encroachment of subdivision developers on the scenic Chattahoochee Hill Country where he and his family owned a farmhouse, Nygren decided to reach out to his neighbors and build consensus around an alternative to the business-as-usual expansion of Atlanta’s exurbs. Over an exhaustive, multi-year process involving no shortage of peach cobbler, the area’s major land owners and the Fulton County government reached an agreement: a small fraction of the land in the hill country would be developed in a compact, New Urbanist fashion to accommodate projected population growth. The majority, in exchange, would be set aside as rural and natural preserves, through transfers of development rights (TDRs). I first read about Serenbe a decade ago in the New York Times, and since then, the development has received no shortage of plaudits… as well as some pointed skepticism. CityLab compares it to the utopian intentional communities of bygone eras, many of which ran aground on their own ambition. Fast Company points out that it’s part of a broader trend of wellness communities that has become very big business indeed for a certain type of well-heeled buyer. The general thrust of press coverage is a combination of admiration for what a nice place it is, and doubt that the model has broader applicability. A strong place is adaptable: it can evolve in the face of disruption—economic, social, environmental—to continue to meet a community’s changing needs. A strong place is fiscally sound: it produces enough real wealth to pay for the maintenance, in perpetuity, of the infrastructure that supports it. A strong place is iterative, and never finished: it is built by means of “small bets” rather than large gambles, so that the feedback received can inform the next set of incremental experiments and investments. These are the questions I had in mind as I visited Serenbe: how does it hold up according to those principles? Serenbe is intriguing to me because it embodies some real contradictions: it is master-planned, high-end real estate, and has been developed according to a tightly controlled and orchestrated vision. And yet it embraces the organic in some ways you wouldn't expect. It is, in its internal design and infrastructure, a paragon of sustainable practices. And yet it is completely tethered to the economy of metropolitan Atlanta, dependent on that economy (and likely on the proximity of the world’s busiest airport) for its existence. I anticipate I’ll write a more thorough piece in the future on Serenbe’s planning principles and future trajectory. For the moment, let's just take a tour. An aerial photo of Serenbe reveals a strikingly minimal street network: no grid here. 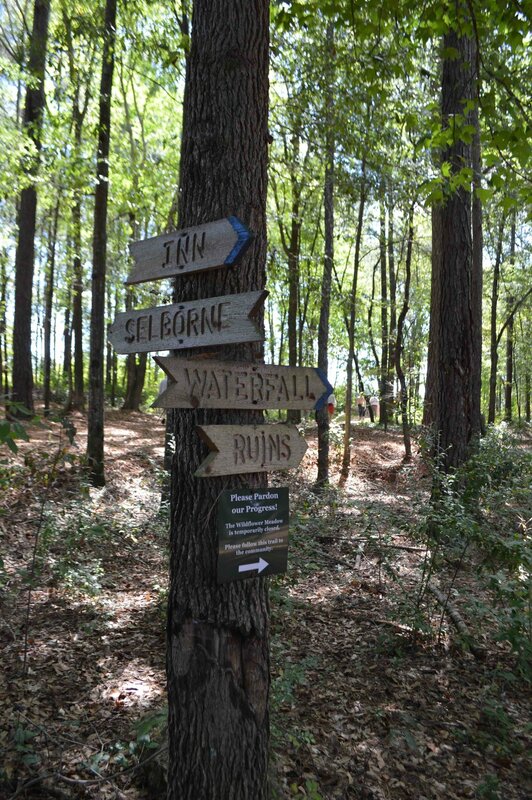 Serenbe’s hamlets are designed so that the pedestrian network, heavy on paths through the woods, is almost entirely separate from the driving one. It’s actually more efficient to walk around the community than to drive. Each Hamlet is laid out in the shape of an “Omega,” with multi-story buildings and commercial uses at the bend in the center. It embodies the New Urbanist idea of the transect, with a transition from less intensive to more intensive land uses as you approach that U-bend. Build-out has been slow and deliberate. Serenbe is growing on a markedly longer-term schedule than a typical suburban development of its size. Build different kinds of spaces, get different kinds of residents. This is in contrast to the common suburban development approach of marketing to a pinpointed target demographic. And it can be seen as a form of risk-hedging for the community: endeavoring to create a place whose appeal doesn’t depend on the fleeting interest of a very narrow slice of the population. Opportunities for social interaction are built into the community—for example, having to walk to get the mail (it’s not delivered to your own house), or pick up your CSA share if you have one. These investments in neighborliness are investments in the place, whose residents will at some point be more responsible for its enduring value than anything the developer has the power to do. Serenbe’s developers have adopted a "small bets" ethos to building the community: they are not wedded to every detail of a multi-decade master plan, but rather have conducted deliberate experiments to tweak and revise it. 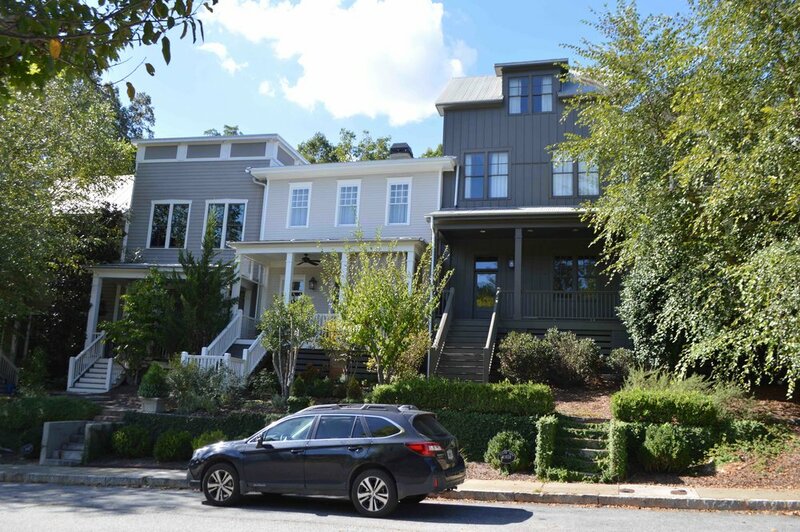 An incipient plan to incorporate an age-restricted 55+ enclave was scrapped when the marketing team found little demand for such a thing in Serenbe. And post-Great Recession, a cluster of small cottages, much smaller than existing homes in the community, was incorporated into one of the hamlets. At the same time, there is strict control over things that could compromise the vision of Serenbe. Houses can be in vernacular or modern architecture, but their interface with the street must fit New Urbanist principles: there can be no front-loading garages and no grassy front lawns. Front porches are obligatory. Trash is collected from underground bins in camouflaged front-yard pits to avoid the unsightliness of garbage cans. The development team controls the HOA, and does not intend to turn it over to residents until the units are at least 90% sold. 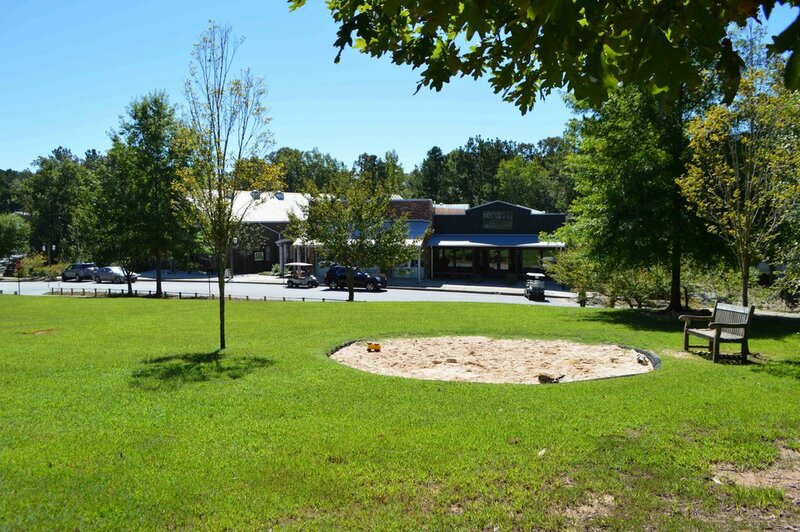 Great care has also been taken to make sure that separate aspects of the Serenbe community can stand on their own legs financially, another bid for long-term resilience. There are no subsidies for retail. There have, however, been some efforts at curation, especially in the beginning, to promote variety rather than a proliferation of “trinket shops” which appeal only to weekend visitors. The organic farm on site is a viable enterprise on its own. Although integrated with Serenbe both physically and through the CSA program, inn, and restaurant, it is treated as a working farm and not as a vehicle to sell real-estate. Fitness facilities under construction now are to be paid for out of their own opt-in membership dues, not subsidized out of HOA fees. 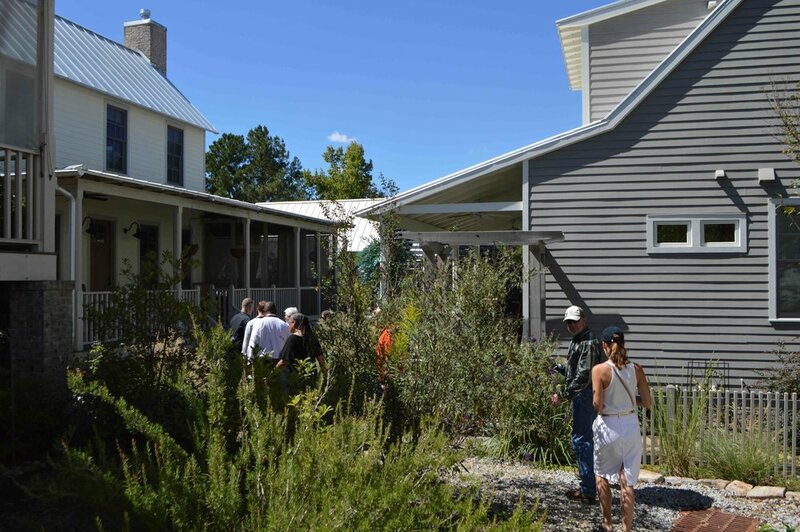 The Serenbe Institute, funded in part through a 1% transfer fee on each home sale, puts on highly successful arts programming, including elaborate theatrical productions. 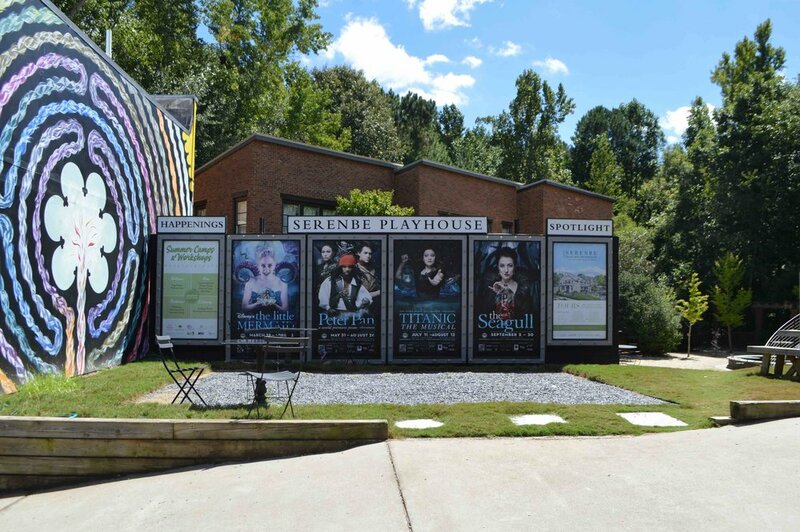 The Serenbe Playhouse has been very successful at drawing attendance to its shows from all over the Atlanta Region, such as a recent production of Peter Pan staged in the middle of the forest. These things aren't mere gimmicks to sell houses. 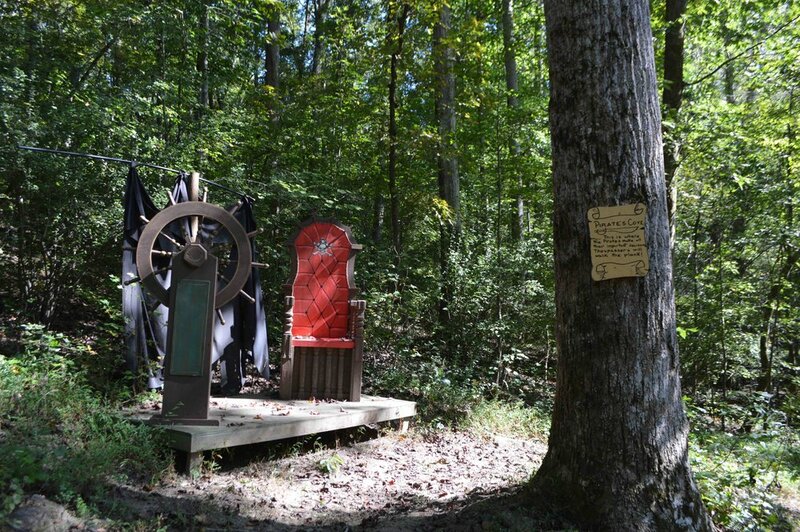 Serenbe’s infrastructure emphasizes a light imprint. There is little pavement per resident, since much of the transportation infrastructure consists of gravel walking paths. Wastewater is treated on site through infiltration. Much of the community’s energy—a share anticipated to grow over time—is generated on site by solar and geothermal means. Heavy-Handed Planning, or Cultivating With Care? Serenbe has been criticized for its “phoniness”—a charge that has been lobbed at New Urbanist developments since the days of Seaside. Certainly the visual character of the community is carefully crafted through a design-review process, resulting in something that can feel a bit more like a movie set than a landscape native to North Georgia. Then again, what is “native” to North Georgia anymore, when Greater Atlanta has ballooned to six million inhabitants, largely through a disastrously unsustainable debt-driven model of growth (as we profiled in our recent multi-part series on Cobb County)? Master-planned communities deserve to be greeted with a baseline skepticism, because of the fundamental principles I began this piece with. A place poised for long-term prosperity needs to be able to adapt and respond to feedback, and there’s a tension between that goal and a design process that is driven by the singular vision of a dynamic individual like Steve Nygren. And yet, there's also a tension between the theoretical ideal of organically growing communities that aren't master-planned, and the reality of what happens when you simply turn market forces loose in an economic (and physical) landscape shaped by absolutely tremendous perverse incentives. We’ve already seen what most of suburban Atlanta has become. It’s Nygren’s vision for this corner of it that has given the Chattahoochee Hill Country a fighting chance of showing us a different model. Is that model replicable, or just the latest form of green consumerism for a niche segment of wealthy home buyers? 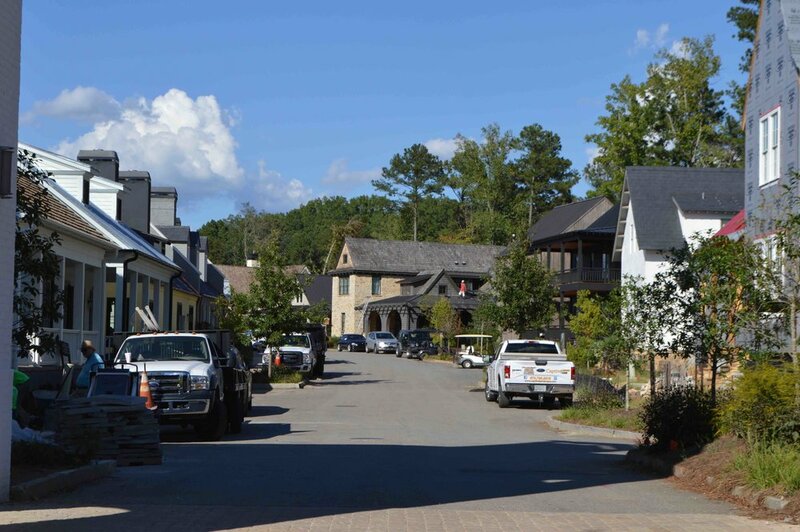 Serenbe has the physical form of an English village, minus the actual economic and social arrangements that produced the English village as their physical representation. Serenbe’s creators have carefully set the stage for a sense of community to take root—"The best reason to live here is the life here" is their marketing tagline. But unlike in an English village, few people who live here are making their living here, and that doesn't seem likely to ever change. The economy is tethered to Atlanta, 45 minutes away on the highway and separated by miles of rural countryside, as well as miles of the standard-issue suburban development that Nygren set out to preclude in his beloved hill country. Is long-term resilience possible in that context? How would Serenbe fare if Atlanta fell into 1980s-Rust-Belt levels of decline? Can we scale the principles that built this place, and how flexible are those principles when circumstances test them? I don't have those answers, but it's an interesting set of questions. More on them another time.